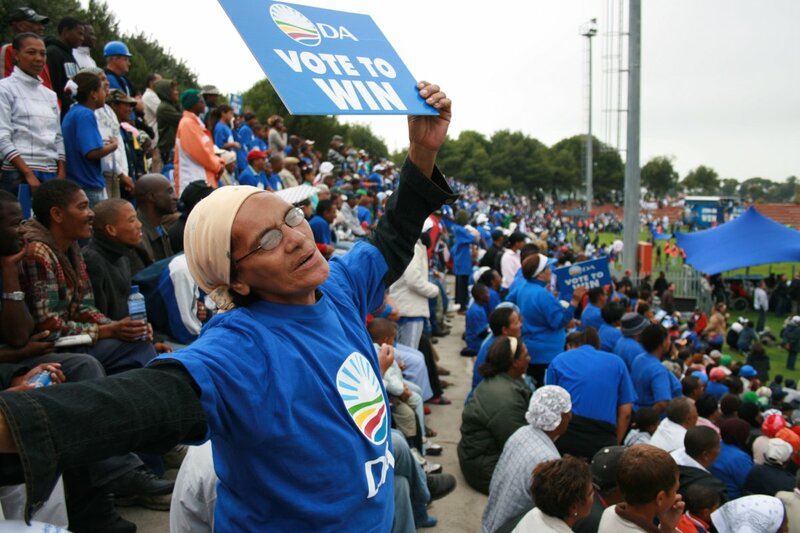 Opposition parties the DA and COPE held their last blast election rallies in the hotly contested Western Cape on Saturday, getting their final words in before the ANC’s Siyanqoba Rally on Sunday. The Western Cape is key to the success of opposition parties in Wednesday’s poll, with the DA, who currently governs the City of Cape Town, hoping to wrestle control of the province from the ANC. Following hot on the heels of the opposition rallies, the ANC will hold the Western Cape leg of its massive nationwide Siyanqoba Rally at the Nyanga Rugby Stadium on Sunday (19/04/2009). At the COPE rally in Khayelitsha, leaders Mbhazima Shilowa and Allan Boesak were the headline acts as a heavy police presence guarded roads leading up to the Site C stadium. About 3000 COPE supporters braved morning showers and chilly weather to attend the rally. Boesak, who spoke powerfully and was cheered with every sentence, said South Africa’s democracy was being threatened and the country “could become just like Zimbabwe”. He said the public had been lied to for 15 years by an ANC who believed they had been “ordained by God to be in power forever, but these days are over”. Boesak’s message was appealing to 78 year-old Nozolile Ganga, who said she had lived in a backyard shack in Gugulethu for more than 20 years. Ganga said she was not happy with the way former president Thabo Mbeki had been fired a few months before the end of his term. As a pensioner, she said she struggled to sustain herself and her family throughout the month, but she hoped that a COPE government would lead to change. Meanwhile at the Stephen Reagan Sports Complex in Mitchell’s Plain, DA leader Helen Zille told about 3,000 supporters that only the DA could stop “Zuma from taking us down the path of the failed state, cronyism and corruption”. Rain threatened to put a damper on the rally, but Zille was not to be outdone, presenting the DA as the difference between the future success or failure of South Africa. ANC leaders, said Zille, wanted to be above the law “so they don’t have to go to jail when they commit crimes”.